2) develop the skills, information, and other resources we need to understand and contest the inequalities that oppress grassroots women. Red Thread, which co-ordinates the Global Women’s Strike in Guyana, invites you to participate in the above public session. The presenters will be grassroots women from communities directly affected by the flood. The speakout will be held at School of the Nations, 120 Parade Street, Kingston. While we know that for many of you Sunday after lunch is normally a time of rest, we are sure you will respect the decision of women whose lives are consumed by work that this is the best time for them to take “time-out” from other work to speak out. Why is this speakout essential? Because in all the discussions and disputes over who made what contribution to the flood relief, those who have not been heard are the grassroots women of every race who braved waist-deep and even chest-deep flood waters filled with every kind of contamination to invent ways to feed, clothe, shelter, teach, nurse, worry about and provide safety and a sense of security for their children first of all. To accomplish this meant even harder and more dangerous work than the work they always do. The reason the women have not been heard before is that the work they did and are doing is kept invisible, as is all the unwaged caring work that women do whether we are in a daily disaster situation or a major disaster situation. That is why, in assessing the impact of the flood, those considered “experts” are speaking of people who earn money for their labour as the “productive sector” and unwaged carers – the women who keep everyone alive –as the ”social sector”. The starting point of Red Thread and women around the world who are part of the Global Women’s Strike is the recognition that women’s unwaged caring work produces value, a fact which is recognized by only one Constitution in the world – the new Venezuelan Constitution. Grassroots women next door in Venezuela fought for and won Article 88 which recognizes housework as “productive”, producing social welfare and wealth, thereby entitling housewives to social security. What we demand, we demand not as charity but as an entitlement. The invisible workers who will speak out to you on Sunday March 13 are unwaged and low-waged women in Guyana – mothers and other caregivers, subsistence farmers, cane, cash crop and livestock farmers, market vendors, small traders, snack sellers, small shopkeepers, garment workers, subsistence farmers, security guards, seamstresses, domestic workers, grassroots activists. They are determined to spell out to everyone, especially to the political leaders at both the central and local government levels, the media, the private sector, the NGOs, the women’s groups, the trade unions, just how much every community depends entirely first on women’s survival work and then on the “rebuilding” we do. Anyone who is concerned about “recovery” and “reconstruction” in Guyana after the flood needs to hear the voice of those who have been ignored and invisible and on whom the whole society depends. Stop the world and change it! Alana King; Colin Ming; Josephine Whitehead;Vidya Kissoon; Nicky Mendes;Rachel Andrade-Sankar, and yours truly (Denise Dias). We ourselves need some emergency cash as we are assisting persons constantly. We decided to use the Alicea Foundation (as we did not wish to complicate other on-going NGO's). Josephine is our treasurer (the best). Alicea Foundation a/c # NBIC Water Street, 653-421-8. Sunday we sent over $200,000G dollars worth in medication to Mahaica area (four shelters over 1000 persons). We are being in-undated. Will give more details later this morning. The Red Cross asked them to also send their information out. 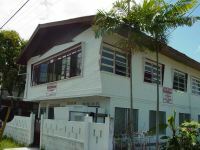 Since the morning of Thursday, April 17, 2003, Red Thread, supported by other citizens, has been holding a non-stop, 24-hour a day vigil outside the Presidential Office on Vlissengen Road, Georgetown. As women we know that it is mothers who have invested our lives in our children, and who hurt most when they are harmed in any way. As women, we know that mothers are usually the ones who lead the fight for justice for their families and communities. Red Thread is part of the Global Women’s Strike, a global network which campaigns for governments to invest in caring not killing. We launched our vigil with the full support of women and men in the GWS in over 70 countries. As in war in Iraq or elsewhere, it is women and children who are the first victims of violence. We were pushed to begin this vigil by the kidnapping, torture, and murder of 16 year old Joshua (Roy) Bell, and by the authorities’ do-nothingness in the face of this atrocity. We, like the rest of the world, understand very well how power works in international relations. We saw that when a US diplomat was kidnapped at about the same time as Joshua Bell both government and the main opposition party sprang into action. We are outraged at the contrast between how the authorities dealt with the kidnapping of the US diplomat and the kidnapping of Joshua Bell. Not by accident, in the first case the victim was released and in the second, the victim was tortured and then murdered, in spite of the ransom paid by his family. All human life is priceless, not least when it is Guyanese! In the upsurge of violence in our country, the first child we know of who was killed was Mervyn Barran of Enterprise. In between that murder and the murder of Joshua Bell, there have been incidents of kidnapping and attempted kidnapping of other children, including, recently, a child in Coldingen and one in Strathspey. The most recent murder was that of 17 year-old Su Zhi Wei of Agricola on April 22, 2003. Before that, there was the slaying of Yohance Douglas. Other children have been wounded and damaged, perhaps for life, by witnessing assaults on and the murders of their parents. And countless others who have not been directly touched live in fear, especially after the murder of Joshua Bell. When one of our children doing the ordinary things that teenagers do can be kidnapped in a busy area of the capital city, what mother will feel her child is safe, anywhere? Mr. President, what Guyanese child is safe anywhere? As an immediate step towards addressing this national crisis, we call on the President to have a special, single-issue sitting of the National Assembly urgently convened to hear an official statement from the Minister of Home Affairs on the situation of violent crime in Guyana with special reference to the killing of Joshua Bell and more generally, to the safety of Guyana’s children, and we call on the People’s National Congress/Reform to set aside its boycott of the National Assembly and engage in this special sitting. In the meantime, we will continue to work with other concerned Guyanese who are pursuing initiatives to restore public safety, and in particular, the safety of our children. In that spirit, we invite other citizens to join the vigil. 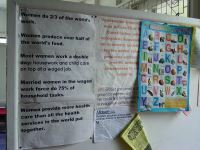 On March 22, 2003, the women of WAVE met to discuss the way forward for the organisation. The Saturday afternoon workshop proved a useful opportunity for members to discuss and re-visit concerns and update members on the valuable work that the committees have been doing. From the beginning, one issue at that has been the focus of much lively debate is whether the group should take “political” action. On this occasion, when the issue arose there was very little debate - the overwhelming consensus was that the time has come for WAVE to explore political solutions. So while the group will remain non-partisan and inclusive and will continue to work with as broad-based a constituency as possible a Political Committee was formed. 1. Building Networks - WAVE must first organize itself as a group that cannot be ignored. The group will organize women across race, across age, across political party and across the country. For the next two months the political committee will focus on building “waves” across the country with a special emphasis on including Indo-Guyanese and Amerindian women. Meetings have been organized in Regions 2, 3, 8, 5 and 10 so far. Initial discussions with Regional organizers have been positive. 2. Data collection - In addition to mobilizing women around Guyana, The political committee has approached the Social Partners and the Guyana Human Rights Association with a view to gathering information about work dealing with violence that has already been completed. This will be used as the basis for developing a position and a series of recommendations from WAVE. 3. Action Plan - The political committee will touch base with other groups such as Social Partners, GHRA, University of Guyana Student Society, the Private Sector etc to discuss possible areas of collaboration. We hope that other groups will agree to present a united front on issues of mutual concern. Members of the committee were part of a delegation that attended an army briefing and discussion session with the Chief of Staff and several senior officers of the Guyana Defense Force.